Sew What? 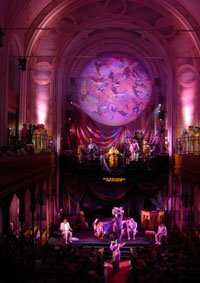 Inc’s custom drapery design and experience stretches across the entertainment and performance industry, to special events and trade show exhibition. 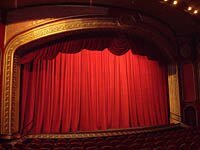 We’ve designed custom stage curtains, theatrical drapes and theatrical backdrops for elementary, middle and high schools, community theaters and auditoriums, college and professional theaters. 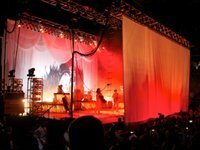 We are well known for our touring draperies for rock concerts and fashion shows, as well as wall and ceiling fabric treatments for conference and exhibit hall booths. No custom drapery job is too big – or too small. Just call us at the number below or email us for a free quote! 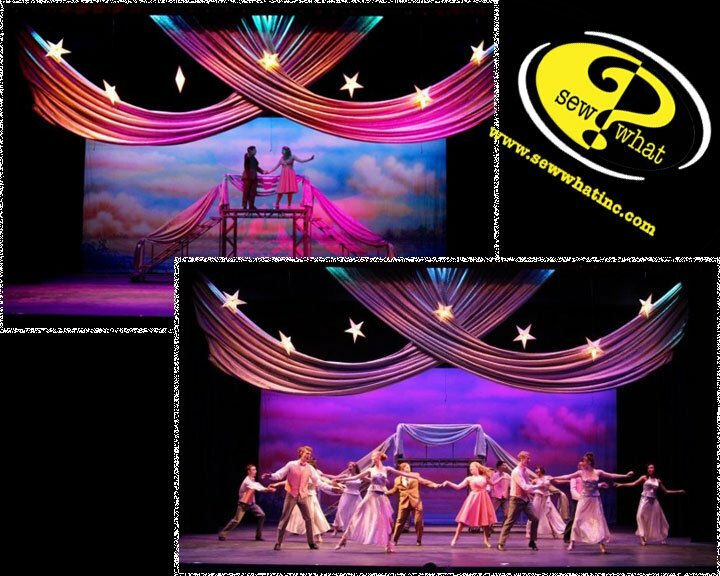 For St. John’s School, we used a combination of rental and purchased goods to help them create a one-of-a-kind stage design for their musical. They wanted to recreate one of the scenes from Curtains, The Musical, so we suggested on our Silver Crushed Satin Legs from our Silver Satin Collection of specialty rental drapes. 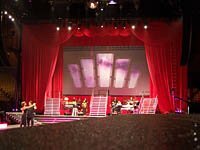 Along with those drapes, the client wanted to dress up the stage with smaller pieces of the same fabric, and so they decided to purchase unsewn yardage of the exact same Silver Crushed Satin fabric to add extra embellishments to certain parts of the stage. Since the fabric reflects light so beautifully, the set designers were able to give the stage various looks by changing lighting schemes and intensities throughout the show. 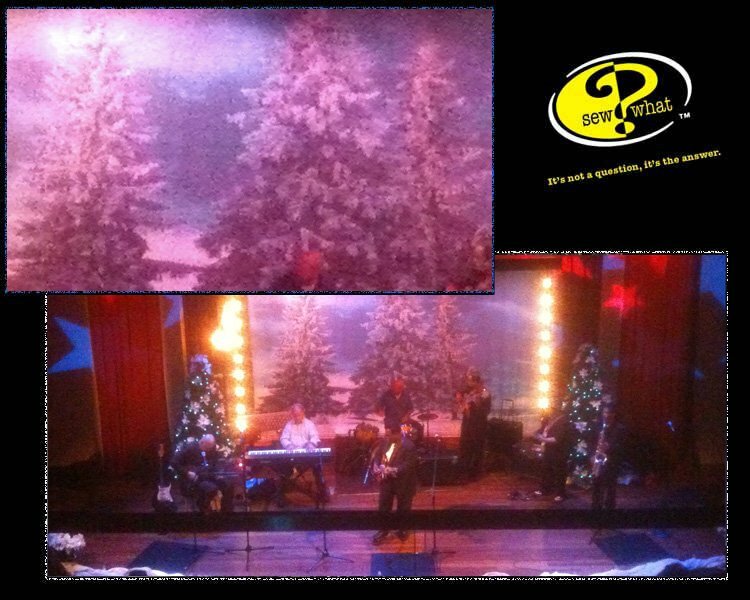 The change of lighting on the drapes helped give the show an exciting and dramatic feel. We loved working with Rock Ridge High School for their production of Mary Poppins. 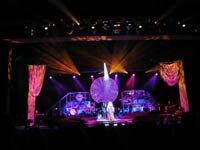 For this show, they wanted an eye-catching drape that would help them create the appearance of a night sky, so they decided on one of our Stardrop LED Rental Drapes. These drapes consist of Blue-White LED lights on a rich backdrop of Black Encore Velour. 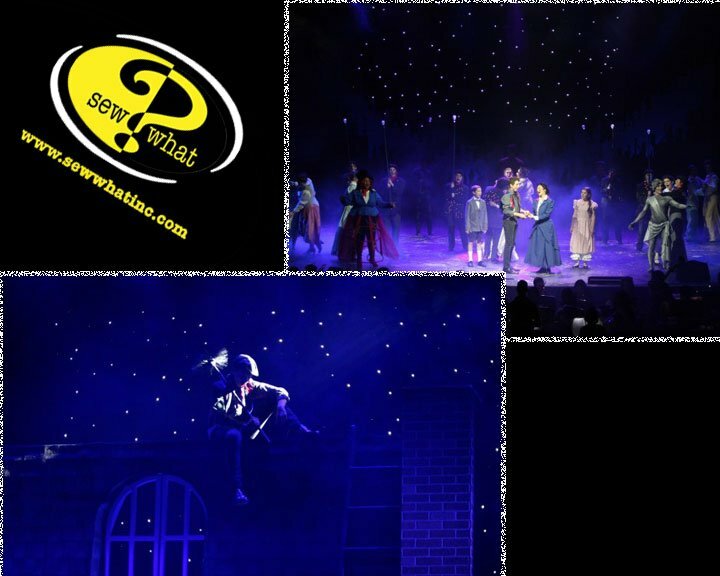 Our Stardrop LED drape is quick to install and extremely easy to operate, making it the perfect backdrop for this production. The school was able to easily control the intensity and speed of the flickering “stars” or have the lights stay completely on or off. The Stardrop gave the production a dramatic “starry sky” effect, along with the rich black velour material also offering a “void” for scenes that needed to stay dark. 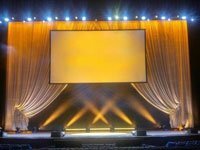 For the Rosemont Theater project, the client wanted drapes that would help frame the proscenium, without covering the projection screen that they planned to hang across the middle of the stage. We recommended our 40’h x 10’w Silver Satin Shirred Drapery Legs from our Silver Satin Rental Drapery Collection to hang behind the screen. Our Silver Tassel Tiebacks were used to evenly pull the drapes to the sides, giving them a “tableau curtain” effect. 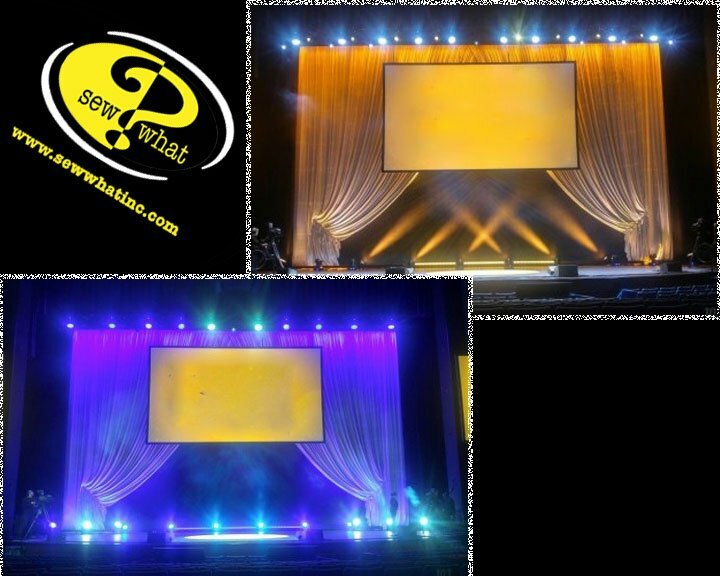 Since Silver Satin reflects light beautifully, the lighting designer decided to project colorful theatrical lighting onto the drapes during different parts of the event. 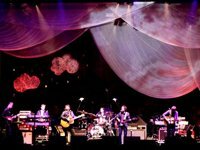 White Voile Specialty Rental Drapes were used in a very notable and effective way by indie folk-pop group The Avett Brothers. Using White Voile Legs and Swags to help create a truly rockin’ look from our Delightably White rental drape collection, these drapes were layered and lit up to be as ultra-cool as the band playing in front of them. The News Observer showcased the band beautifully, and ultimately showcased our specialty rental drapes too. 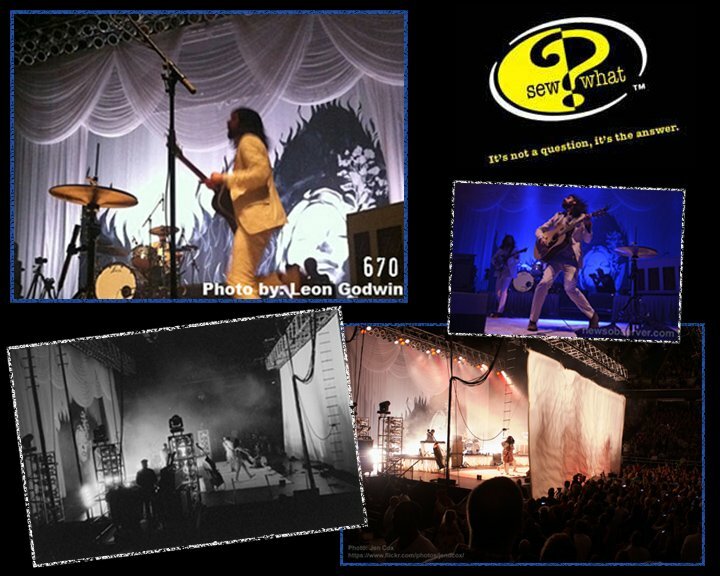 Using these white voile drapes along with a dramatic Kabuki Solenoid Drape reveal for their New Year’s Eve show, The Avett Brothers were able to create the extraordinary look they were going for. Click here to read the related blog post. Click here to view the related Flickr gallery. White FR Spider Stretch, a fabric traditionally used for lighting and shadow effects, was sewn into a family of half and whole swags in varying heights, widths, and fullnesses, along with two sets of legs, to create an off-kilter balance of drapery that can be lit with varying colors and even projected on, to create a gauzy romantic feel. Upstage, a metal mesh drape provides another layer of texture and contrast to the stage design. Recently, Rent What? 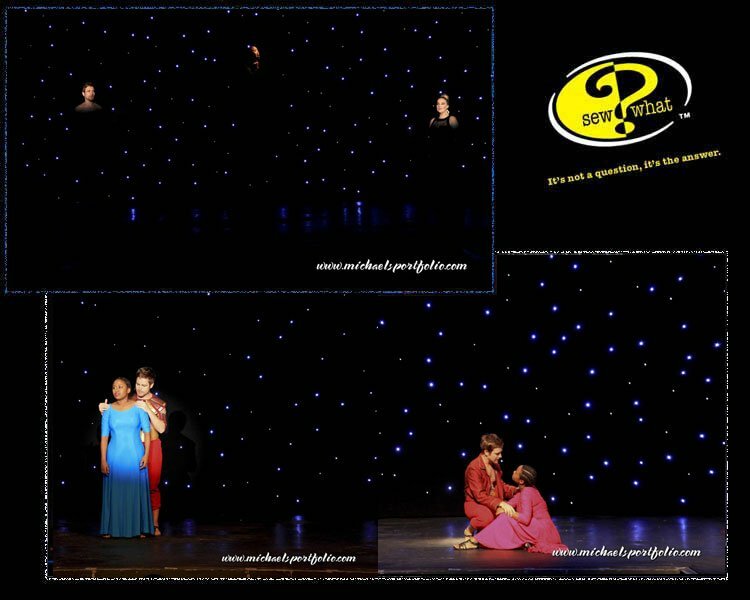 Inc. had the honor of working with Stage Center LA (which stands for Louisiana), who performed Elton John and Tim Rice’s timeless broadway musical “Aida“. In order to make a beautiful backdrop of stars for several important scenes in the production, they used one of Rent What’s 30′ x 15′ Stardrop LED drapes. These incredibly versatile and inherently flame retardant rental drapes can be “rotated” to have either side be the width or the height with grommets and ties on both sides. This offered our clients a lot of flexibility with how they could be hung, and allowed them to help create the exact look they were going for. Show photographer Michael Boyd captured everything perfectly, showing just how beautiful the drape worked in their production. Great example that shows how dramatic a digitally printed backdrop can be. The season theme played out perfectly with the lighting and props. Learn more about our digital printing process and how simple it is to order your own custom backdrop. 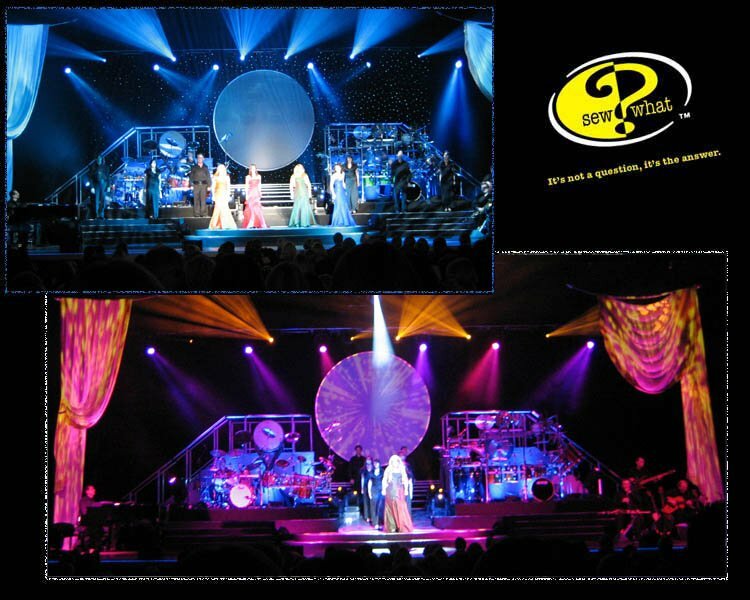 While Celtic Woman is a touring production, it showcases a group of 5 very talented singers in a theatre style presentation. The design was specific and unique, calling for absolute accuracy in developing swagged legs and drapes to perfectly mimic designer renderings. As the show was designed in England we needed to offer comparable American textiles that would look and light like the UK fabrics being called out. This classic design with a contemporary twist showcased our custom sewing abilities beautifully. This tour drew entirely on pieces from Rent What? Inc’s “Silver Satin Series” rental inventory. 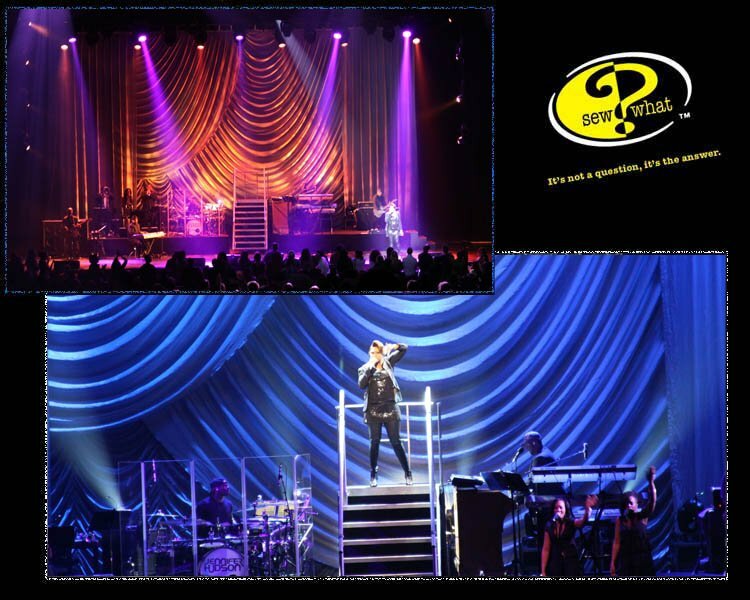 The specialty stage scene for Jennifer Hudson was sophisticated and affordable for a new artist on her first tour. Of the many pieces available in the Silver Satin Series, an Austrian backdrop, giant contemporary swags and velour legs offered full upstage coverage. Downstage was a bi-parting traveler track and main stage drapes, also rental pieces from Rent What?. Rent What? is proud to feature quality stage curtains and backdrops made by Sew What? Inc.
Once again we had the privilege of working with Gridworks, one of the premier providers servicing the audio/video needs of the cruise line industry. This most recent project was for Princess Cruise’s Ruby Princess while in dry dock. 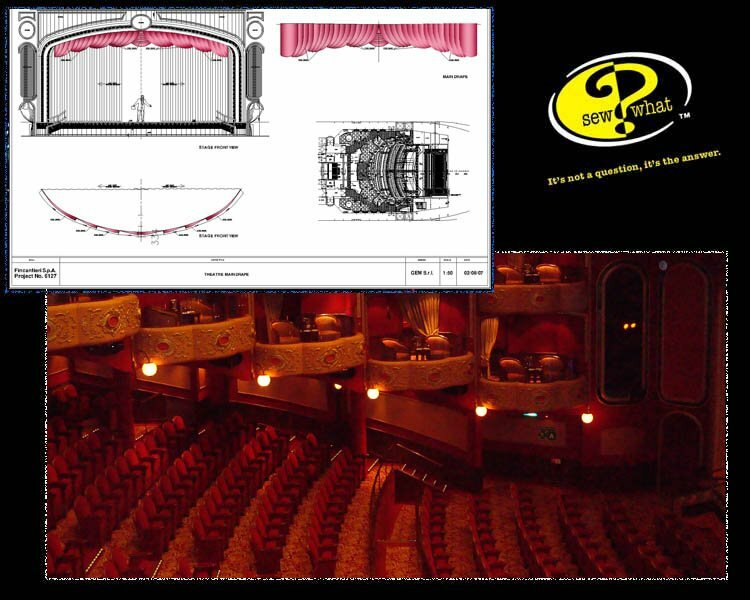 Gridworks team of installation experts had visited the ship some months prior to dry dock, and were armed with the measurements for a fast changeover and successful replacement of the drapery elements in both the Princess Theatre and Explorers Lounge. All elements were sewn from Inherently Flame Retardant velour. Aside from the obvious and most featured Austrian Drape there were over 20 other items dressing the stage – including several scrims, a leno, a muslin cyclorama and plenty of masking drapes, legs and borders. How could you not love this show! One of our most prized “drapery performances” – our drapes are the star of this touring stage. By utilizing 8oz Supervel, an inherently flame retardant fabric which is light weight and yet durable, we brought designer Butch Allen’s vision to life. Let’s face it – nothing says Broadway like red velour and lots of swags! By the way – all the elements drop into hampers and pull out for tie off at the next venue – everything was made to be installation friendly. 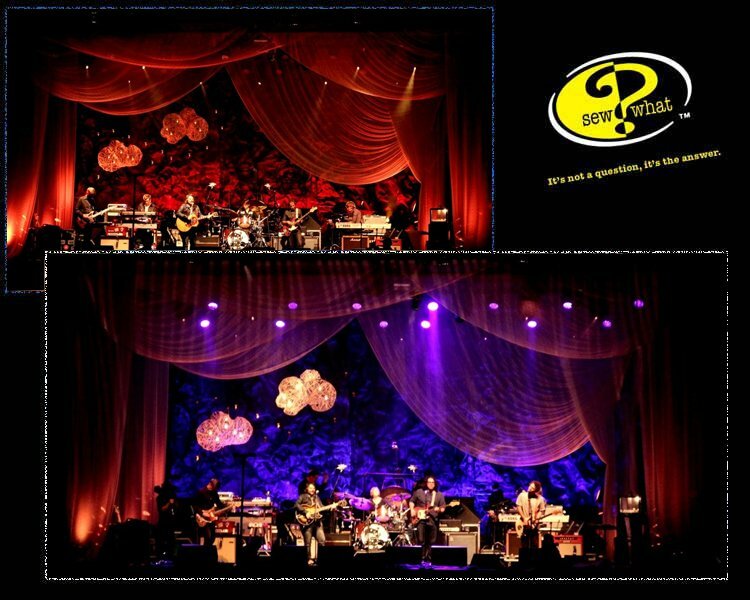 Both the producer and designer knew “what” they wanted for the live DVD recording of John Mayer at the Nokia Theatre. Only problem was – they could not “find” it as a rental. 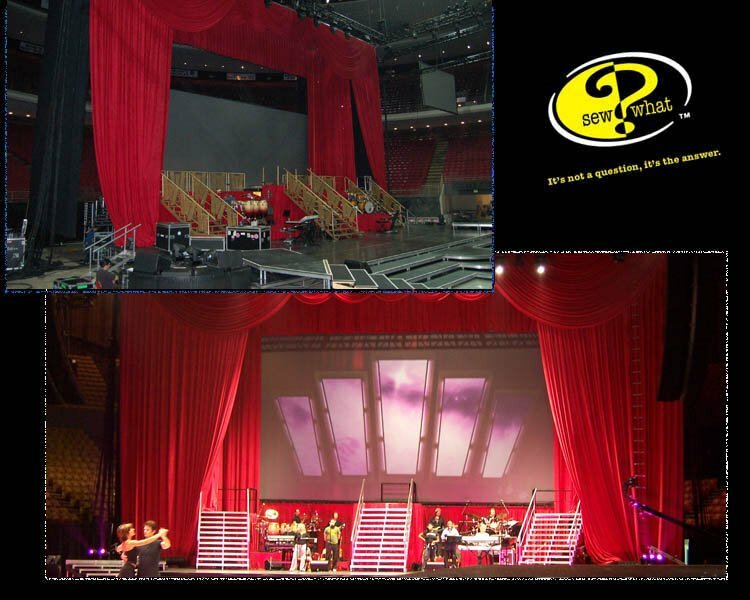 Their decision to custom make a drape to suit their needs was made only 3 days before the show was to be filmed. Needless to say they were thrilled to learn that Sew What? could not only make the 30’ x 60’ Austrian Drape in time, but could do it at an affordable price. 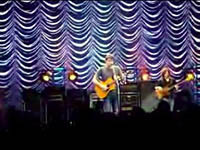 PS: So catch this news: the Nokia Theatre loved the drape so much they actually purchased it from the John Mayer Production and it is now a resident drape at the Los Angeles Nokia Theatre! Gridworks is one of the premier providers servicing the cruise line industry. This particular project was for Princess Cruise’s newest addition to their fleet, the Queen Victoria. Initial artist renderings showed design concepts and then a visit to the ship wile being built in Italy solidified the dimensions prior to construction. All elements were sewn from Inherently Flame Retardant velour. 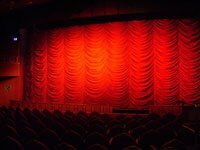 Aside from the obvious and most featured Grand Drape and valance there were over 25 other items dressing the stage – including several scrims, a leno, a muslin cyclorama and plenty of masking drapes, legs and borders. 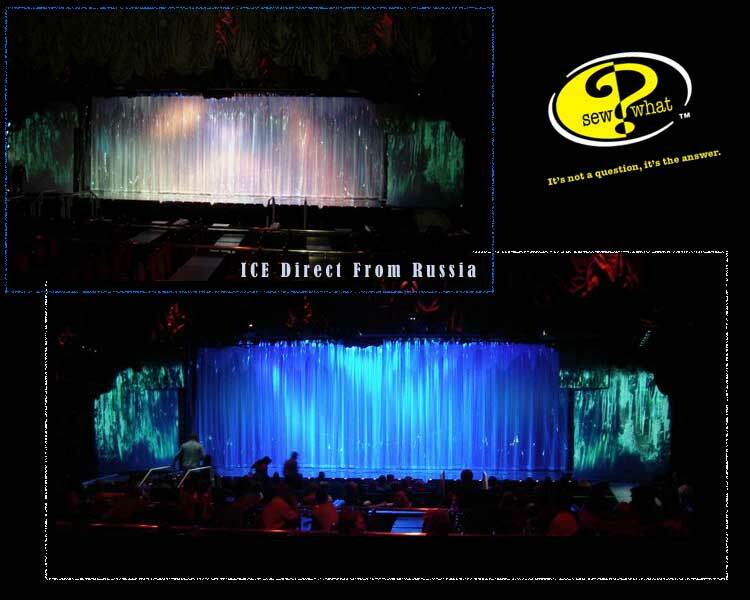 Project: ICE Direct From Russia. The Riviera Hotel, Versailles Showroom. Las Vegas. This was a challenging project and an unheard of suggestion – Make drapes from clear vinyl! Despite initial fears and trepidation we jumped headlong into the non-traditional use of this “tenting” substrate. Not only did the drapes hang beautifully as can be seen in the image, but the effect was indeed “ice-like”. Just what the designer had envisioned. Sewn in a traditional theatrical style with 50% fullness and webbing grommets and ties at top, this plastic curtain will hang rink-side in Las Vegas while the artists make their magic on the ice. ………… DIGITAL PRINTING by Sew What? Lee Breuer and Bob Telson’s award-winning Broadway show returns for its 20th Anniversary Tour with the Blind Boys of Alabama, the Original Soul Stirrers and J.D. Steele of the Steeles. The Gospel at Colonus is a musical celebration that seamlessly blends the agony of Greek tragedy and the ecstasy of American gospel music and the sanctified church. Designer Alison Yerxa chose a variety of colored and patterned voiles which when layered and combined with crushed satin created a dynamic stage set design. Addition of bullion trims and woven ropes gave accent to the swags and jabots on both upper and lower levels of the scene. The beautiful rendering designed and created by Alison Yerxa was reproduced as a digital image onto coated vinyl and is seen as the medallion nestled into the arch of the church. Sew What? 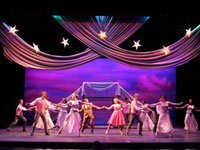 Inc’s digital printing services have been utilized by many of the top designers and performers, as well as for many ballet and opera companies. Click on the image for alternate view. 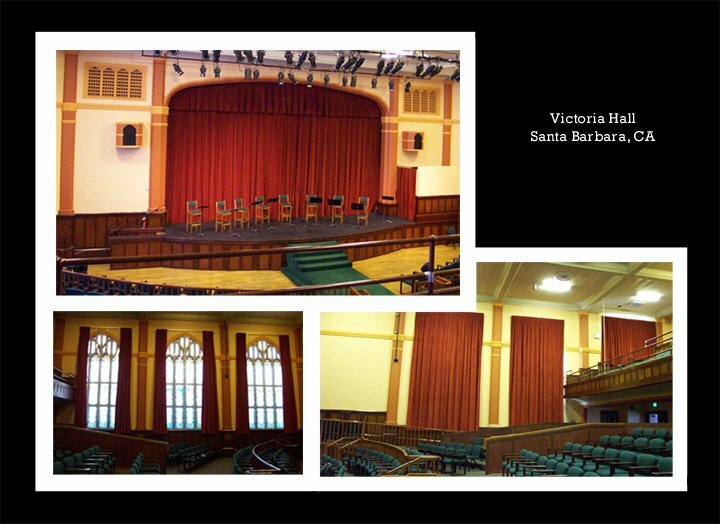 Victoria Hall in Santa Barbara recently underwent a facelift, with a new grand drape and window treatments provided and installed by Sew What? Inc. Utilizing a beautiful sienna 21oz cotton velour, all the drapes were fully lined with the added beauty of 100% fullness. Click on the image for alternate views. 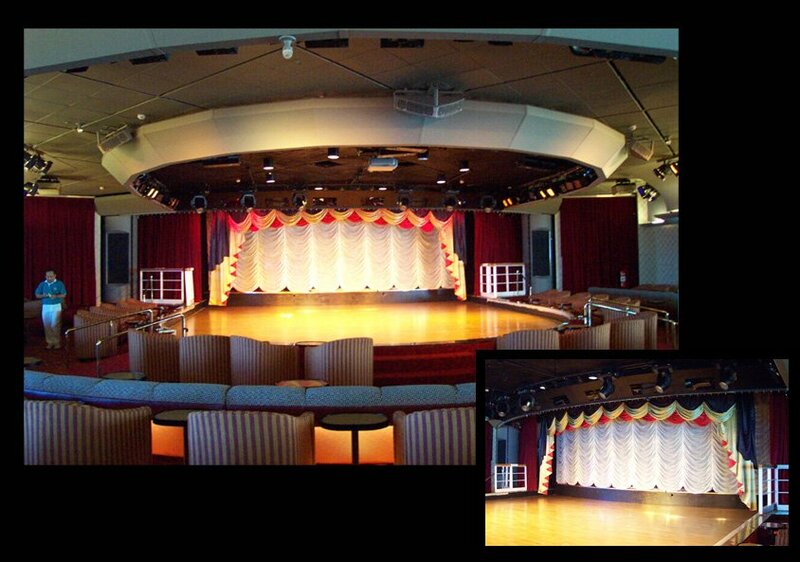 This 40’w x 9’h custom backdrop was painted for the award winning cruise line “Crystal Cruises”. Painted entirely by hand with durable outdoor paints, this drop can be seen sailing the seven seas aboard the Crystal Symphony. A beautiful and dramatic proscenium piece. This is a static piece (no lift lines), and all layers are attached to a common webbing to hang from a single traveler track . The side legs are lined and the top swag treatment created with three layers of swags. Entry drapes, held back with plush tiebacks give such a rich and beautiful appearance. The valance is treated with a custom-dyed bullion fringe. Upstage a poly cyc is revealed. The Austrian is operated by a motorized lift system that tracks each lift line in unison. Full widths of fabric are utilized and therefore liftlines are falling every three feet. At Sew What? 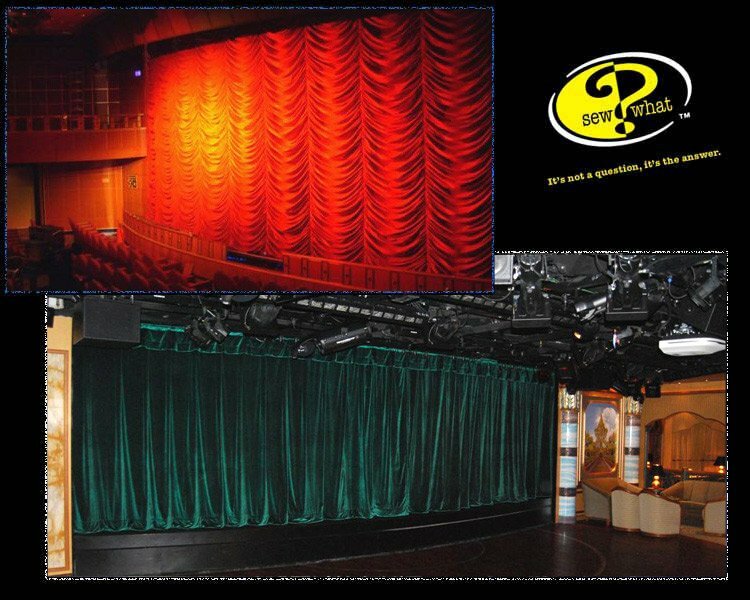 we are one of the premier manufacturers of premium theatrical austrian draperies. Our experience is extensive. Contact us for references. Sew What? 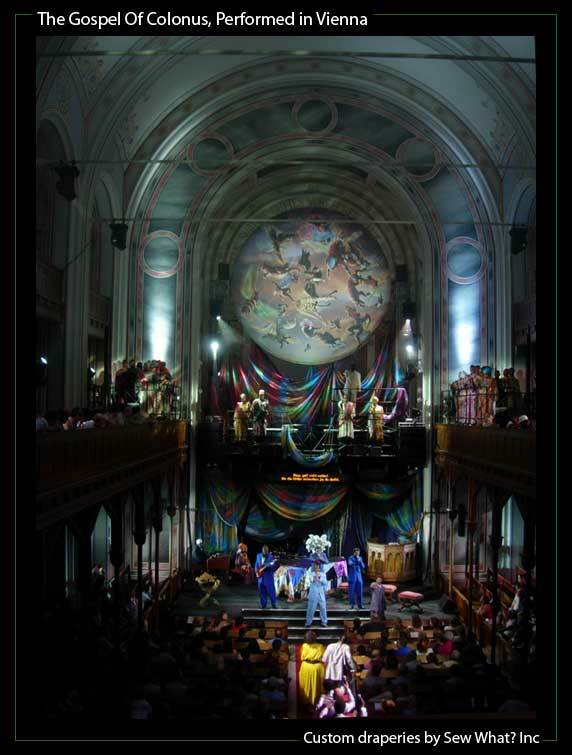 Inc. has a fascinating Company History, and is proud of the wide variety of custom theatrical drapery designs that we’ve manufactured over the years. We welcome your questions about your own stage curtain and theatrical drapery needs.